Adolescence is a time of growth for children, for both physical and mental development. A healthy diet is essential for teenagers because of their heightened nutritional needs, but also because the foods they eat as teenagers can impact their health when they reach adulthood. Healthy eating also promotes good food habits to last a lifetime. Teenagers need to consume more calories because their bodies are growing rapidly. According to HealthyChildren.org, adolescents need more calories each day than at any other point in their lives. In general, teenage boys need to consume 2,800 calories each day and teenage girls need to consume 2,200 calories per day. These caloric needs are even higher for teens who play sports or are otherwise very physically active. Teenagers should eat foods in the right proportions. Approximately 50 to 60 percent of the calories should come from carbohydrates, HealthyChildren.org notes, with the majority of these coming from complex carbohydrates. Fat should make up less than 30 percent of a teenager's calories. These guidelines will also ensure that teenagers get enough protein, which is notable because teenagers consume, on average, twice as much protein as they need, HealthyChildren.org reports. Vitamins and minerals are also critical for teenagers because they are needed to help the body make new tissues and function properly. Teenagers should eat a variety of foods, especially fruits and vegetables, to make sure that they get all of the vitamins they need. Milk is a healthier choice than sodas for most teenagers because it provides calcium and vitamins A and D and helps with making new bone during growth spurts. Unless your teenager has been diagnosed with a vitamin deficiency, it is better to get vitamins from food rather than supplements because these foods provide fiber and other important nutrients needed for proper growth, KidsHealth.org. 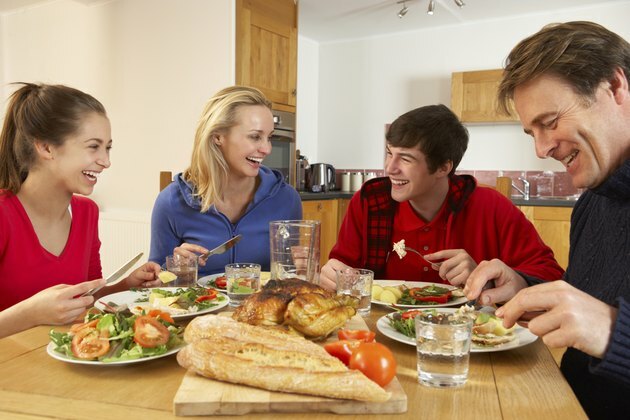 As teenagers mature into adulthood, they may continue some of the eating habits they developed earlier in life. A diet high in sugar and fat can promote weight gain and poor health later in life, particularly once the teenager's metabolism slows down. A diet high in sugar can also increase a teenager's risk of developing heart disease later in life, the American Heart Association explains, as it can cause teenagers to develop poor cholesterol levels that persist into adulthood. How Does Junk Food Affect Developing Teens? Can Foods Make You Grow Taller?